Jonny, a fifth grader from Limón 1, loves coming to FunLimón after school. Jonny takes English classes and participates on our youth baseball team. We focus on youth education, because it gives youths the tools and the capacity to be the agents of positive change within their families and in their community. By providing opportunities for local youths to expand their knowledge and skill base, we prepare them to qualify for higher-paying work and improve their standard of living. To that end, we have 4 main initiatives: youth education, supporting local primary schools, vocational education, and our university scholarship program. 1) Children in Limón, Nicaragua go to school for just 4 hours a day. This means that youths in the area have a great deal of unstructured and unsupervised free time. In our experience, this often leads students to participate in risky and dangerous behaviors. 2) The local school curriculum lacks instruction on critical thinking. In short, wrote memorization is the primary teaching/learning technique. 3) Most local families cannot afford to pay for children to participate in extra-curricular activities. 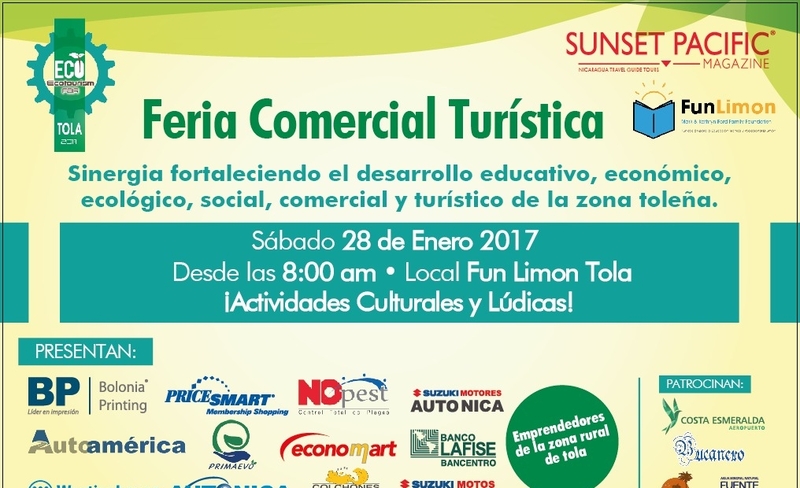 FunLimón is a safe place for local youths to have fun and continue to be intellectually stimulated. We are open 12 hours a day and offer after-school activities, including computer classes, English language instruction and music. Currently, 74% of the students from the local primary school are enrolled in one or more of our educational activities. Carla Membreño Quedo, our youth computer teacher and FunLimón scholarship recipient, is in her third year of university and will soon graduate with a degree in marketing. Carla holds a certification in computer science and currently has 36 young people enrolled in her classes. Our computer course covers the basics of Windows XP, Microsoft Office and Internet navigation. After completing our 60-hour program, students are able to make word processing documents, create spreadsheets on Excel, design presentations on Power Point and conduct research on the Internet. And when they graduate, they are armed with a certificate that gives them a competitive edge when filling out job and/or university applications. Carla Membreño, our youth computer teacher, helps students make a bar graph in Excel. Our English language teacher, Vicente Ramirez, is a Nicaraguan native and former Fulbright Scholar at St. Michael’s College in Vermont. He currently has more than 70 young students enrolled in his classes. Through our 720-hour curriculum, English students can progress from beginner level to English proficiency. Students are taught reading, writing, listening comprehension and most importantly, conversation. Our youth students gain extra practice by reading children's books in English and writing letters to their pen pals in the United States. We believe their English language skills will open many doors to them in the future. Students from a beginner level English class play a vocabulary game during their Thursday afternoon class. Music is a very important component of education. It gives people the opportunity to use their talent and creativity as a form of self-expression. 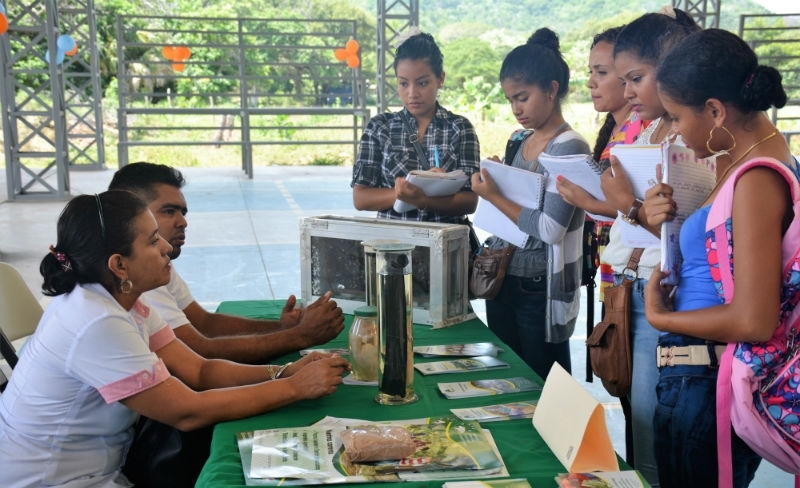 For young people in Nicaragua, it can also help them connect with their history and culture. Estelí native and nationally famous mariachi José Viales currently has 21 students at FunLimón. He teaches them how to read music and gives vocal and guitar lessons. They are exposed to many kinds of music – including Nicaragua’s traditional folk music. 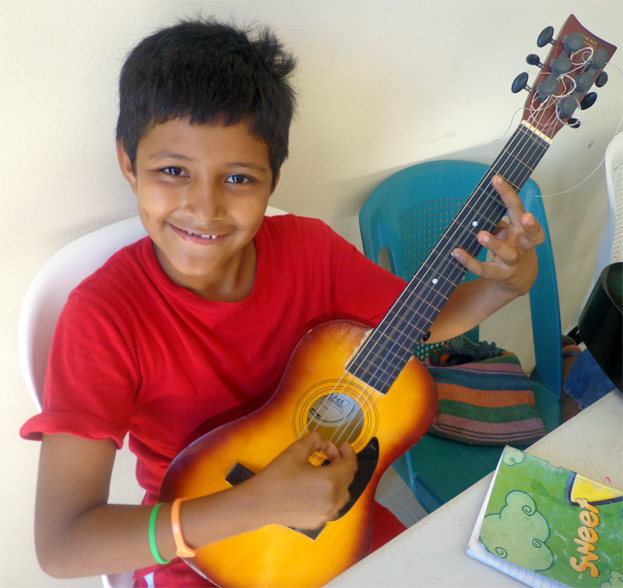 Byron, a fifth grader at Limón 1 primary school, takes guitar lessons every week here at FunLimón.